Many of us have set a New Year's resolution at one time in our lives. With the start of the new year, I wanted to set some professional goals. Being in the information business, I knew I needed to eat my own dog food and conduct a deep analysis of 2017 before blindly throwing darts at the dartboard. 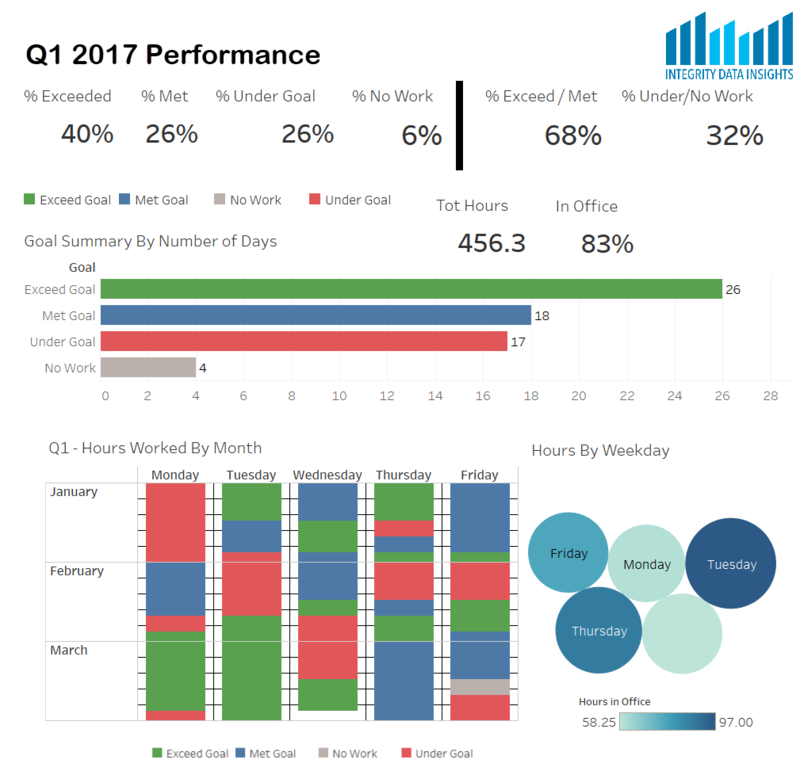 I gathered my data points and decided to break my year into quarters, focused on typical Monday - Friday workdays. I classified my data with some simple buckets of how each day went. The colors really started to help tell the story. Clearly Mondays in January were a weak spot for the quarter. They were all red indicating I was under my goal of 8 hours worked in a day. This made sense given I was exploring my career options with interviews on Mondays, and New Years Day and MLK also fell on Mondays. 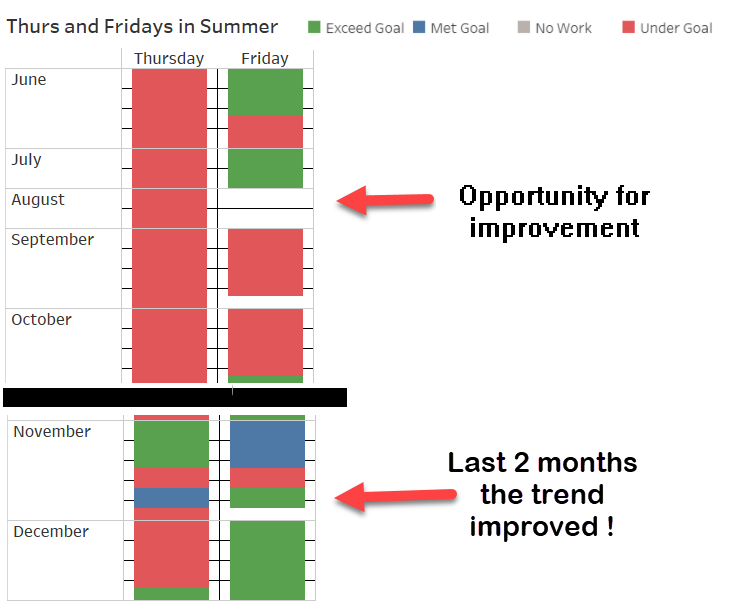 My Monday performance improved greatly in Q2 and Q3 as my career direction began to take shape. 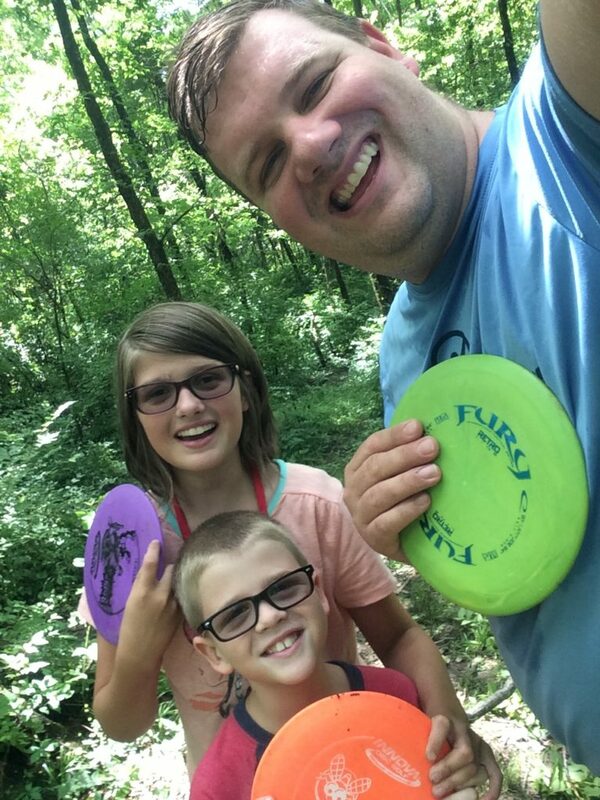 I enjoyed the summer months with my family. Although we traveled more than ever before, I was still able to work on projects for my clients remotely. My job is ensure my clients are satisfied. This can require working on the weekends. 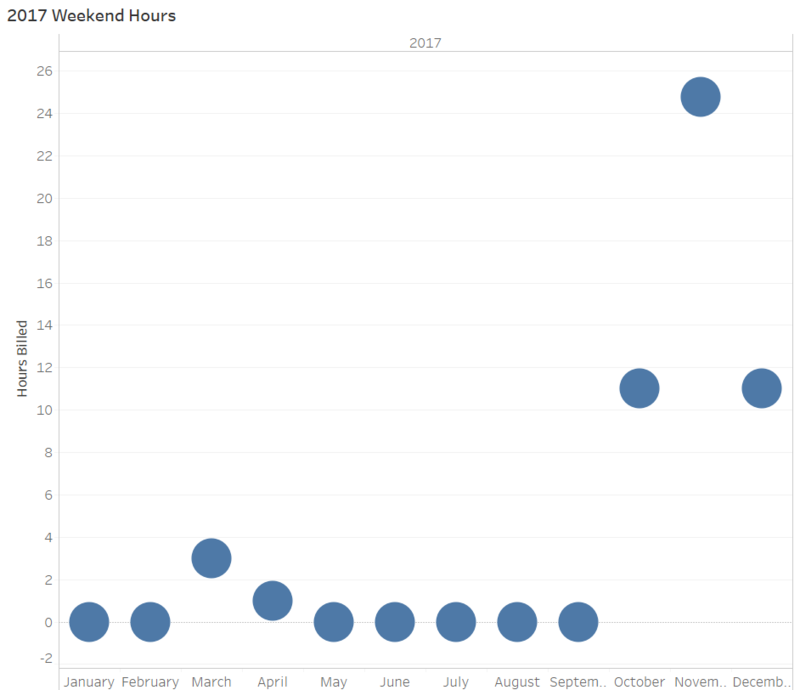 The extra weekend hours were a big driver of the strong Q4. Looking at the entire year at a glance, several things stood out. 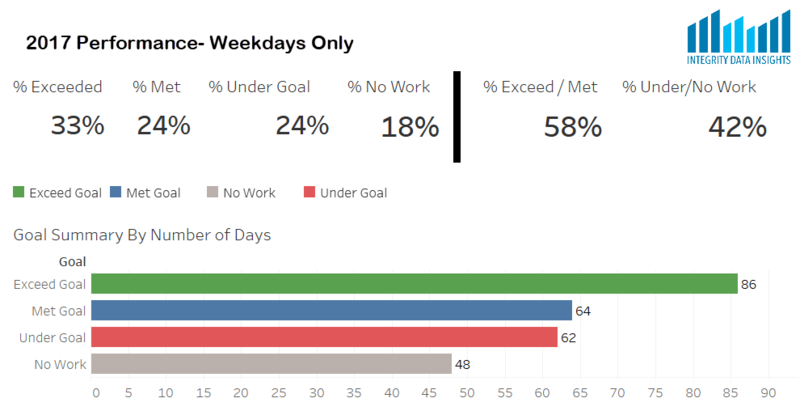 Days that I work, I often work more than 8 hours (33% Exceeded Goal). I also learned that there is a lot of opportunity in 2018 with many weekdays under utilized (42%). 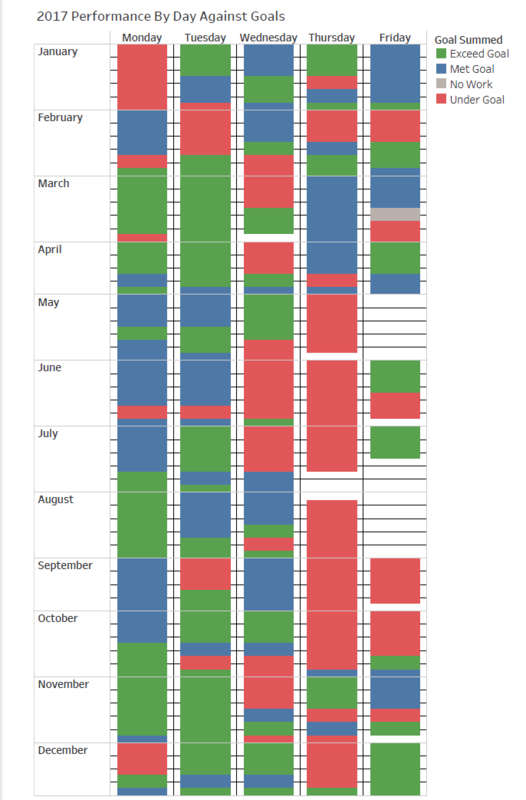 The whole year at a glance is insightful. It almost looks like a DNA strip. You can clearly see a lot of red and white space. Especially on Thursday and Friday. ← Sharing Insights With Your Company Doesn’t Have To Be BORING!